Please see attached picture. This is a beam in a basement of a renovated house. Basically, there was a huge concrete patio that is now an upstairs living room and a basement downstairs. So, this is the ceiling in the basement. My plan is to possibly repair this concrete beam and then put an I-beam on jacks under it or possibly and 8"x8"x1/2" angle iron. I'd like to use angle iron if possible, because headroom is already at a premium. The floor that it is supporting is roughly 4" thick. I'm not sure if this will work or not. I know most people will say to get a structual engineer's opinion, and I will, I was just looking for any comments or suggestions from here. Hi, yes the concrete beam appear fixable but to come up with more specific solution, I need a little more information. The diagram below show dimensional information needed in order to make specific recommendations. You can provide me this info and I will revise the solution proposed below. 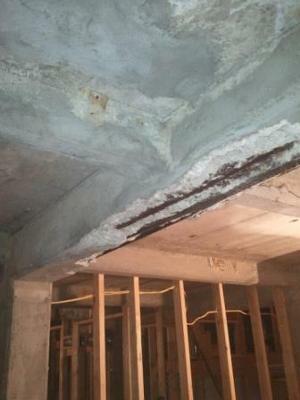 Based on the photo, there are two possible reasons why the concrete beam is in the condition shown. First rebar corrosion, when moisture, salt, oxygen find their to concrete reinforcements, the result is corrosion. When rebar corrodes rust builds up increases the volume of rebar causing the concrete to crack which eventually lead to concrete falling off. inches. You might need to check and add more floor joists if needed. If the framing to the right of the concrete beam are in fact attached to the concrete beam it is highly likely we are looking at an overstressed concrete beam. When this happens the bottom side of the beam is in tension causing the concrete to crack. My proposed fix is to add one steel channel on either side of the concrete beam as shown in the detail above. 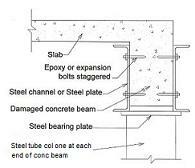 The size of the steel channels need to be big enough to carry the total load including the weight of the concrete beam. From the photo it appears there is another concrete beam coming from the left side and attached to the damaged concrete beam. If this is the case the damaged concrete beam is definitely overstressed. 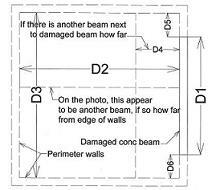 The point load transferred in to damaged concrete beam is huge which makes sense as to the location of the damage. The fix above still works if you have a beam coming across perpendicular to the beam you are trying to fix. You can notch the channel at the beam but just below the notch weld a steel bar 1/2 inch thick by 3 inches wide and extend them about 18” beyond the notch on both sides. Weld the steel bar continuously to the steel channel. At the end of the concrete beam and steel channel beams, install one steel tube column on either side(two total). The new steel columns and steel channels will carry the load in lieu of the concrete beam. Prior to doing any work install a temporary column at the middle of the damaged concrete beam to shore it up. Install the new channel steel beams and the columns before attempting to fix the exposed rebar.